When a Notice of Allowance (NOA) is received by the Applicant, it means that a patent application will no longer be reviewed by the examiner and it is entitled to the patent under the law. In other words, an application is about to be issued after the prosecution phase. However, the NOA may have errors or data missing, failing to correct them at this critical stage may impact the quality and the enforceability of the patent. Depending on the severity of the issue, an RCE may need to be filed to make necessary corrections or even defer or withdraw patent from being issued by filing a petition. Once the patent is issued the chances of correcting these errors get drastically reduced. Once the NOA has been issued by the patent office, an applicant will have three months to pay the issue fee during which the application should be reviewed thoroughly to ensure correct. Collating a series of checkpoints at the NOA stage with reference to various critical fields in the Image File Wrapper (IFW) before paying the issue fee, is very important. Identify all the related dockets and verify if all the references is cross-cited among the dockets in the family. All IDS and 1449 from PAIR is downloaded to check if the examiner has completely reviewed the cited art or if there are any strikethroughs. Determine if the art is from a foreign OA for the corresponding docket and if it is within the purview of 37 C.F.R. 1.97(D). Discrepancies in priority information, ADS, specification, filing receipt, and PAIR should be verified. With the help of IFW the requirement of restriction, response to restriction, detailed action, and restricted claims are checked. Examiner amendment to claims should be verified with the latest claim document. PAIR data should be reviewed to determine if ‘Notice to File Corrected Application Papers’ was received with or after the NOA. incomplete or missing middle names, transposition of names, spelling mistakes in ADS and Filing Receipt against Oath/Declaration should be verified. Along with the above mentioned checks, there are also other portions which needs to be examined to to keep the issued patent error-free. 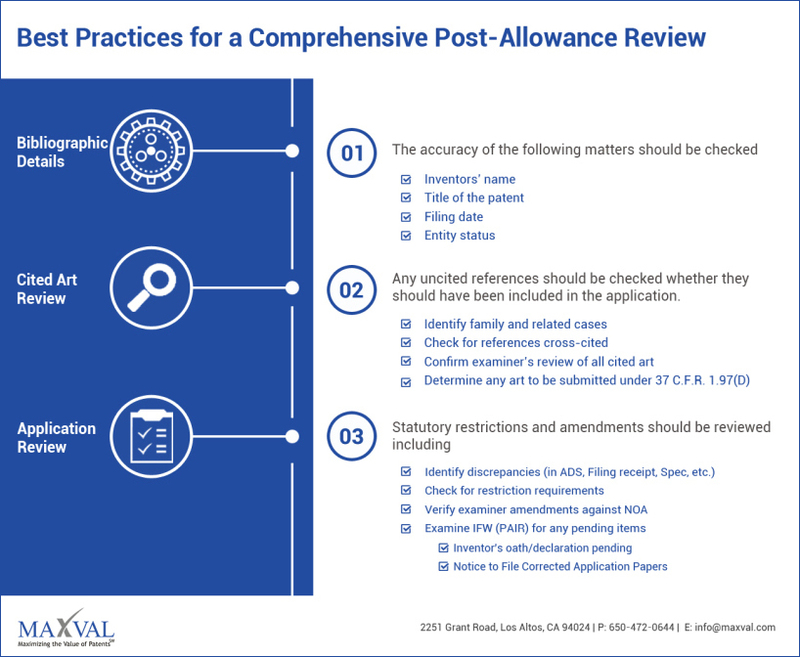 MaxVal provides Patent Issue Fee Review services to review the applications that are in allowance and provide a comprehensive report. Please drop us a line at bd@maxval.com for a post-grant review or for a free template of NOA review checklist.